Data deduplication is a process of removing old, unused and other extra copies of files. Storage deduplication greatly reduces backup procedure by only dealing with unique regular (daily, for instance) changes, while constantly maintaining daily full backups for immediate restore. This has proved itself as a best deduplication solution for companies. Let’s have a look at reasons and find out if there are any other options. What Is Deduplication for Companies? Among the top expected features of backup software, there have always been reliability and ease of use. Data deduplication directly supports two of these. Actually, you can integrate the most of deduplication software into existing storage infrastructures, so no one should worry about the tricky interface. The reliability is provided by constant verification, looking after the faults, and healing. The two main types of data deduplication are the source and the target ones. Target deduplication reduces the amount of disk needed to store your data, but it does not change the amount of bandwidth needed to get the backups to the server. So this approach can be recommended to the companies which don’t boast the great bandwidth. Source data deduplication requires you to use different network server backup software. That way, if a file has already been backed up by the backup server before it won’t be again transferred across the net. This reduces the amount of disk space required to store your data as well as the amount of bandwidth necessary to send the data. What Should You Check, When Purchasing Storage Deduplication Software? The network backup solution features literally unlimited customization options: due to the platform architecture you can create (or get created by Novosoft) whatever plug-ins you wish for careful backup of specific data. 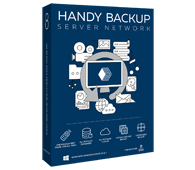 We advise you to try Handy Backup Server Network - it’s great for the network backup (via CORBA). The product boasts fast differential backup using rsync and minimizing the storage volume required. Handy Backup is capable of performing the tasks similar with, say, storage deduplication as if these were with the best deduplication solution out there!